“Morning, Miss Hawkins,” Riley said, distracted by the sight of her. Sunlight danced through the pile of curls on top of her head. The golden glow of the sunrise highlighted the creamy perfection of her skin and the entirely kissable state of her pink lips. Warmth and a spark of liveliness danced in her deep blue eyes. Rather than surrender to his irrational yearning to hold her, he worked the cinch loose on his saddle. As he took his neckerchief from her hand, his fingers brushed across her open palm. They both drew in a startled breath at the jolt the touch created. 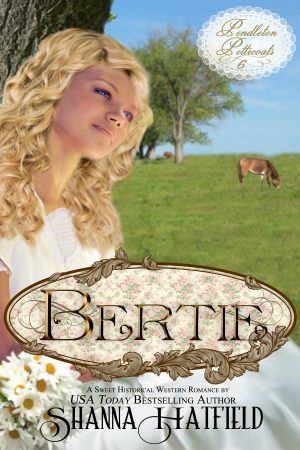 Bertie raised her gaze to his. Her eyes were wide and luminous as surprise and something Riley refused to acknowledge shined in their depths.